A couple of posts ago I wrote about my descent down an internet research rabbit-hole on “watteau-back” dresses – a design feature that first emerged way back in the 1700s and was notably reincarnated in the 1950/60s. Watteau-back dresses basically involve a big old load of folded fabric at the back which give the appearance of a cape/train. Cool eh? I’m into it in any case, and decided to try incorporating a similar effect into a dress or two. My favourite examples are those where the dress is fitted through the bodice (rather than a sack/shift shape) and where the watteau is a continuation of the skirt fabric rather than an additional, separate piece. These things combined pose a considerable technical challenge. How to add all that volume at the back without losing the shape in the bodice? For my first experiment, I chose the BHL Georgia dress, a closely fitted pattern with a cupped bodice, narrow straps and panelled skirt. Construction-wise, with wrong sides together (i.e. with the fabric still folded along the fold line) I pinned and stitched a line down the “centre back” mark for 10cm. This basically gave me a massive pleat which I played about with and pinned until I was happy. In the end I went with two layers of pleating, the first one 25cm wide, the second one 15cm wide. Once it was all pinned securely, i flipped it over and stitched within the seam allowance along the top before trimming off the excess. I then treated it as one back skirt piece and followed the construction as directed. I should probably state (before I leap into a whole list of things I immediately want to do differently) that I love this dress. I’ve worn it to two weddings and it got lots of lovely compliments at both. I’m glad I persevered with the bodice (hang in there, anyone who’s mid-project!) because it’s by far the most glam thing I’ve made for myself and it makes me feel fab. 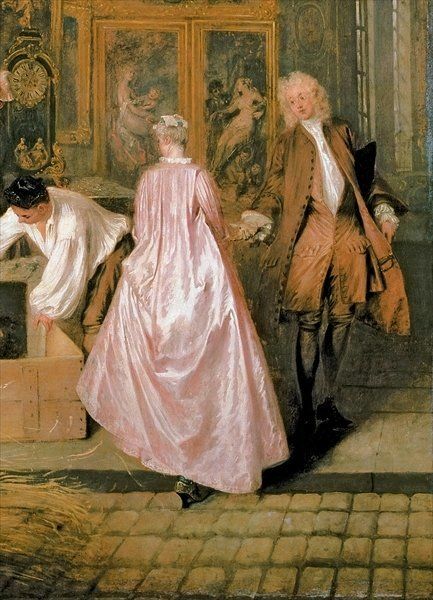 BUT – watteau-wise… meh, it’s not reeeeally what I had in mind… I meant they look like big old pleats, which are nice… but it’s not really the swoopy, drapey, dramatic cape-effect I had in my mind’s eye. On pattern drafting: The adding-to-centre-back-seam method seemed to work pretty well. But for next time, I need to go all-out. A watteau starting at the shoulders and ending at the floor, for full-on cape-mania. I also might need to add even more pleats to make it look really intentional. On the other hand, to make the pleats stand away from the dress up top, it might be worth experimenting with adding a layer of something (netting?) along the top few inches… To be seen! Finally, a quick word on the rest of the pattern – as with all BHL creations, it’s thoughtfully drafted with excellent instructions, supplemented by the comprehensive sewalong on their site. In terms of fit, the BHL ladies strongly advise you to toile the bodice and I would strongly support this advice! I think I had about three goes before arriving at a fit I was happy with. I followed their instructions for a 1” FBA and adjusted the curve quite a bit, just by by pinching and pinning and transferring to the pattern etc. This sounds like a lot of adjustment but I think it’s to be expected with this sort of pattern. We all have such different shapes and sizes, it would be impossible to draft something which fits everyone’s leading ladies perfectly. Fair to say the watteau journey is not over yet. I’m looking forward to having another go once I find the perfect fabric – will keep you posted! This story begins a long time ago (ahem, last summer) with an airline losing my bag. Or rather, not losing it, just not quite managing to get it on the same plane as me. Easily done airline, no hard feelings. To take the edge off the 4-5 hour delay, we headed into Bristol and found ourselves wandering the charming streets of Clifton Village – fancy. Somewhere between the artisanal pottery and avant-garde stationer we came across a little arcade full of vintage shops, wherein I spied a gorgeous 1950’s cocktail dress. From the front it had a standard 50s fit-and-flare silhouette, but at the back was this magical cape type thing. Extra fabric that cascaded down and blended with the hemline of the skirt. The shoplady was not ok with me taking a photo, so I mentally filed it under “work out how to do that” and moved on to browse the vegan bookstore/café next door. Apparently (thanks Wikipedia) the sack-back gown was all the rage in the 1700s: “This style of gown had fabric at the back arranged in box pleats which fell loose from the shoulder to the floor with a slight train.” This style of dress was popularly portrayed by 18th Century painter Antoine Watteau and so the pleated cape part became simply known as a “Watteau”. Fair to say then, I became pretty obsessed with the idea of a watteau back dress. And yes, life and other projects got in the way, but this plan stayed simmering at the back of my mind, until finally a fabric-buying-spree spurred me into action… I think I’ve mentioned before that the “problem” with buying the local waxprint fabric is that it tends to be sold in massive 5m quantities (for making matching skirt/top/headdress/babycarrier combos). And yes sure you can always use the extra to make furnishings and gifts… but as I sat looking at the lengths and lengths of newly purchased gorgeousness, it occurred to me that maybe the time had come to put that excess yardage to a different use. Maybe it was time to BRING.WATTEAU.BACK. This skirt story actually starts with a blouse. A really lovely part of my job is that I get to work with wonderful people from all over the world… And a cool side effect of that is that they occasionally send me beautiful gifts from all over the world! This blouse is one such item, straight from Mexico. It’s feather-light cheesecloth cotton with gorgeous embroidered flowers across the front and back yoke. I received it on a Friday, right in time for a garden party on the Saturday… I just needed a skirt to go with it. I had a clear vision for my skirt – short, simple grey chambray, with a centre-front seam and exposed zip at the back (both design features I loved when I made my denim Brumby). The blouse is billowy so I didn’t want anything voluminous – no pleats or gathers this time. So I drafted a super simple A-line pattern, following these instructions. You basically work from your waist and hip measurements and add a couple of darts for shaping. Then just pinch in the darts and retrace to draft the facings. When I came to cut out, I decided to use the fringed chambray selvedge along the hem. This hadn’t been my original plan but upon closer inspection it was just too pretty not to use. I ran a line of zigzag stitching around to stop it unraveling too far. I double topstitched the centre-front seam in white and orange to tie in with the colours in the selvedge and to add a tiny, visible-to-probably-only-me detail (love those). I inserted the exposed zip at the back using the Brumby method. And that’s it. It probably goes without saying that this was a super speedy half-morning project. But I do love the result. Especially with my Mexico blouse.